Leaving Munich early in the morning, we reach the city of Bregenz (Vorarlberg, Austria) after a highway ride of about two hours. Greeted by our Vorarlberg tourguide, we will visit Bregenz during a city sightseeing tour by bus, minibus or car, including a visit to the stage of the Bregenz lake festival appearing in the James Bond film "Quantum of Solace". Getting back on our bus, minibus or car, we will drive along lake Constance past Lindau to Friedrichshafen, where we will arrive at lunchtime. Boarding a lake cruise ship, we will have lunch onboard during a marvellous panoramic cruise on lake Constance before arriving at the "flower island" of Mainau. 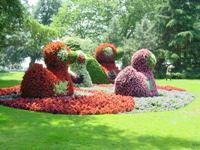 Joining an English guided tour through the gardens of Mainau, we will discover the history and beauties of lake Constance and participate in a wine degustation of local wines. Crossing lake Constance one last time, we reach Meersburg, from where your driver will take you back to Munich directly. Comments regarding lake Constance panorama tours: Our full day sightseeing excursions to lake Constance are also available from locations other than Munich, for example from Innsbruck, Augsburg or Stuttgart. Additionnally, Austria tour operator City Tours is also ready to arrange sightseeing tours for groups and individual travellers residing directly in Vorarlberg or next to lake Constance.